We recently heard that HSE had banned children from riding donkeys in a donkey derby and so had to be replaced with inflatable sheep. This was news to us. In reality the change appears to have been due to the cost of the insurance premium. HSE had no involvement at all. 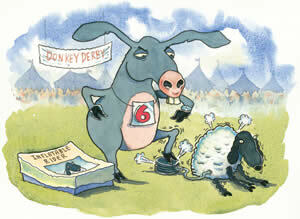 Other donkey derbies took place around the country without any problems. If you're organising a public event, it's wise to look for an insurer who specialises in this kind of policy, talk with them if the standard terms cause difficulty and plan properly so that the risks are responsibly - and sensibly managed.